You don’t learn our system – we learn yours. When you partner with eBridge, you get more than just a platform, you get a dedicated team of people. We support you through every step of the reverse auction process. Successful reverse auctions are about the Process and the People (not the platform). We work at your direction, as an extension of your team, to humanize your auction. We start with getting a clear understanding of how you purchase, so we can mirror your process. Then we come along side you with our 6 Steps to offer a Full-Service Support Process. Open specifications and competition among qualified vendors are the cornerstones of a successful reverse auction. Since reverse auctions are not a fit for every purchase, our process begins with an in-depth solicitation review to assess the competitive nature of each purchase. eBridge can mirror your current process and create a solicitation based on your needs. Our years of experience and large library of specifications ensures a complete solicitation that clearly communicates the unique requirements of your organization. A large pool of vendors leads to increased competition and achieving true market value for your purchases. eBridge’s team of purchasing professionals works diligently to source vendors based on your criteria. Our “high touch” personalized sourcing process delivers superior results that cannot be achieved simply through advertising. Once you approve the solicitation and vendor list, eBridge posts the solicitation to our website (or your website, if preferred). We then email the approved vendors an invitation which includes a link to download the solicitation. 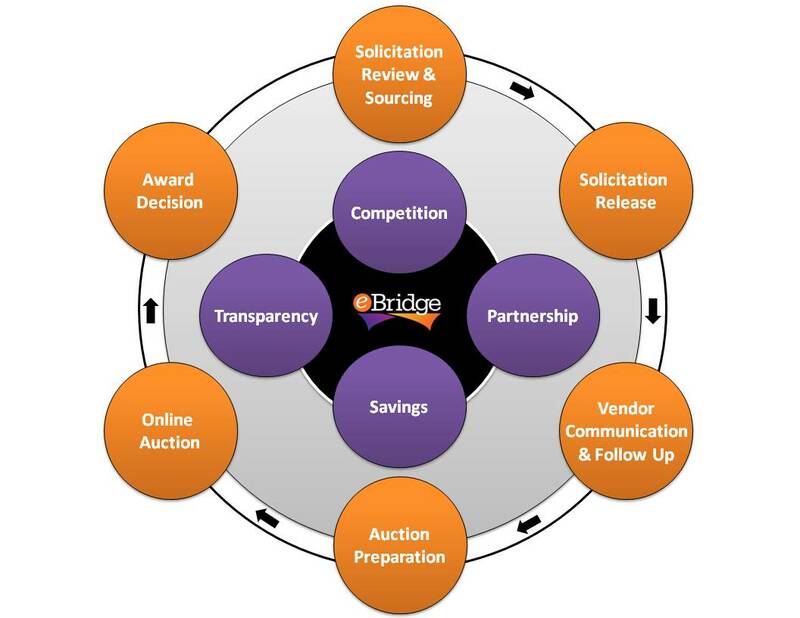 eBridge works as a neutral conduit between you and the vendors, answering questions about the reverse auction process, gauging vendor interest and reminding vendors of all milestone deadlines. This step ensures maximum awareness and encourages participation. eBridge works with you to finalize the bidding layout to ensure all required pricing is collected. Next, eBridge completes a one-on-one personalized training session with each approved vendor, walking them through every step of the auction process. Our web-based reverse auction creates a dynamic, competitive pricing environment for your purchase versus the “one bid per vendor” paper bid format. At a set date and time, vendors log in with their unique username and password and begin bidding. Dedicated eBridge team members monitor the live auction until its conclusion. eBridge delivers 3 bid tabulation reports immediately following your live auction. Our bid reports enable you to award faster with the confidence of a transparent purchasing environment. The key to a successful experience is Partnering with you from start to finish. Interactive workshops, Lunch & Learns, and customized training (for buyers, end users & vendors) help to explain why reverse auctions are “Not difficult – just a little different.” Our Weekly Reports keep everyone on the same page and Post-Event Evaluations provide a chance to recap, revise, and find the next great fit for reverse auction. We will do what we say we will do and be found worthy of your trust.